Super low bunks to accommodate low ceilings. We love tackling a challenge, and Petra and Zara’s room gave us just that. This SOHO home had a few quirks that put us in the fun position to reimagine one of our favorite compact bunk bed designs, our LoLo with stairs. Traditionally our LoLo stands at a short 64”, already an ideal size for homes with low ceilings. Petra and Zara’s room had dropped ceilings that could not accommodate this size. 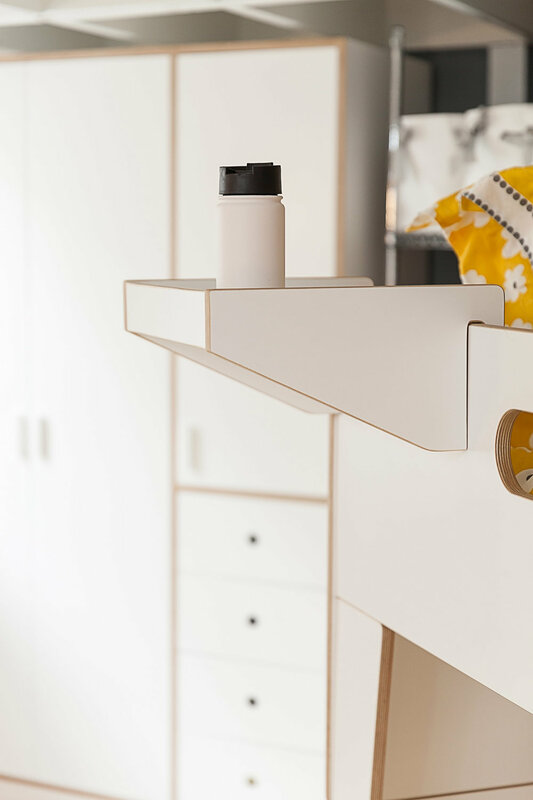 One of the lowest custom bunks we’ve designed yet, Petra and Zara’s LoLo is just 54” high. The lower bunk sits directly on the ground with attached hanging trays for both girls to rest their water or books through the night. Custom storage stairs add to the sturdiness of this low bunk bed. The bed can convert into two twin sized beds later. Additionally we provided Petra and Zara with a custom, adjustable armoire. The large double doors features three adjustable hanging bars that can shift in height as the girls grow taller. Behind the right door you can find adjustable shelving and on the bottom we gave the girls four deep storage drawers to share equally. Since this room is already small in size and has dropped ceilings, we did not want the room to feel further enclosed. We chose an all white finish with exposed plywood edges to expand the room. A white finish brightens any room. 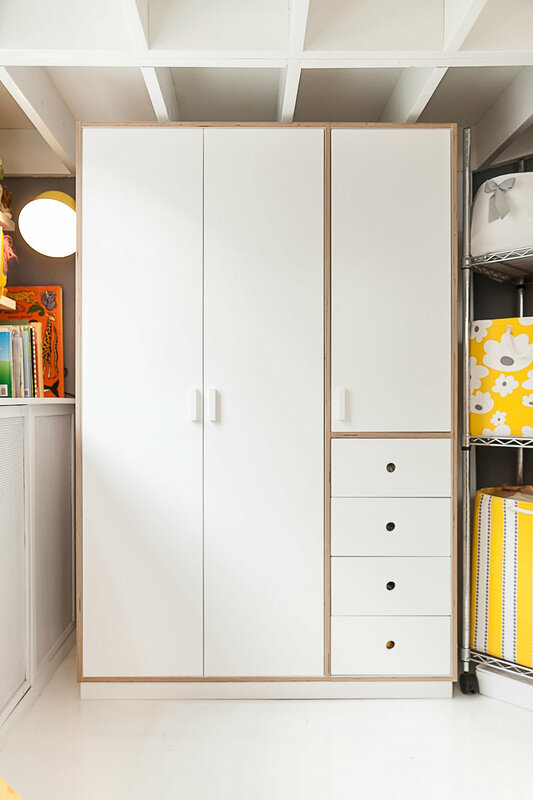 In Petra and Zara’s room, their white furniture was paired with bright yellow decor for a splash of color. Eye-catching, sleek, and modern their room is perfect for this pair of stylish sisters.